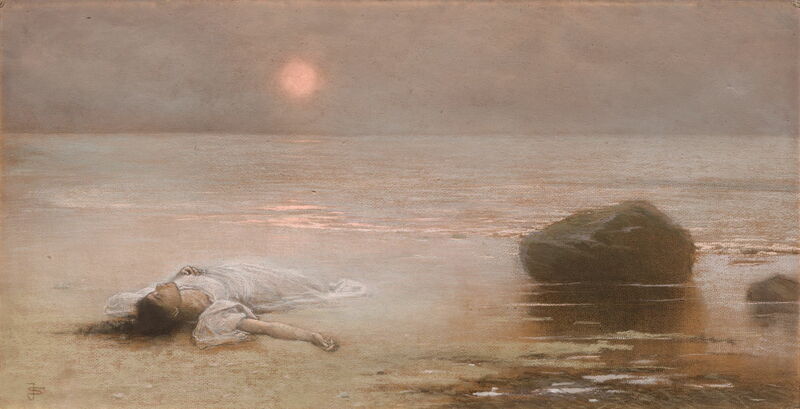 Jakub Schikaneder (1855–1924), Utonulá (Drowned Woman) (1893), pastel on cardboard, 45.5 x 88cm, Národní galerie v Praze, Prague, The Czech Republic. Wikimedia Commons. Many of the men who had drowned in the first article in this series were fishermen, for whom it remains an occupational hazard. 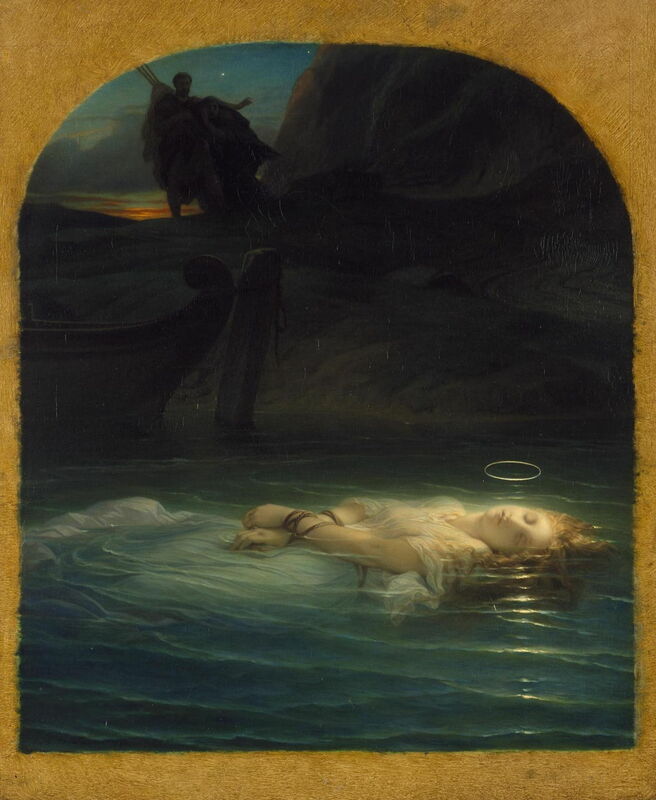 This second article looks at paintings of drowned women, who are more likely to have committed suicide. I use the term Utonulá, a word common across several of the languages of central and eastern Europe, and the title of an opera by Mykola Lysenko: it means drowned woman, and encapsulates in sound what I show in the paintings below. John Everett Millais (1829–1896), Ophelia (1851-2), oil on canvas, 76.2 x 111.8 cm, Tate Britain, London. Wikimedia Commons. 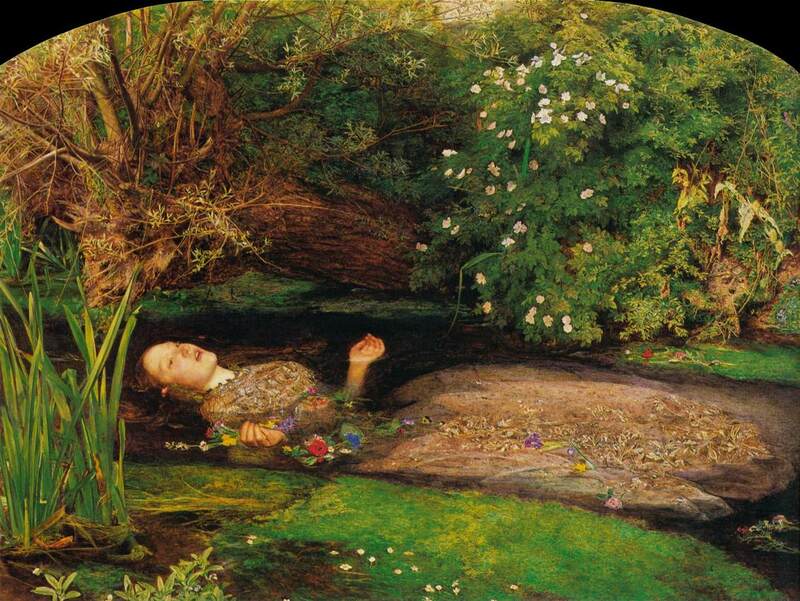 The most famous drowned woman was Ophelia, in Shakespeare’s tragedy of Hamlet, and probably the most famous painting of Ophelia drowning herself in the “weeping brook” is this, John Everett Millais’ Ophelia from 1851-2. It has rich and very Pre-Raphaelite symbolism in the flowers: roses for love, possibly also alluding to her brother calling her the ‘rose of May’; willow, nettle and daisy for forsaken love, suffering, and innocence, respectively; pansies for love in vain; violets (in her necklace chain) for faithfulness, chastity, or young death; poppies for death; forget-me-nots for remembrance. Millais and his model, Elizabeth Siddal, who later married Dante Gabriel Rossetti, went to great lengths to remain true to nature. Siddal had to endure long and chilling sessions immersed in a bath full of water, and the background was painted en plein air near Ewell in Surrey, England. Paul Delaroche (1797–1856), The Young Martyr (1853), oil on canvas, 73.5 x 60 cm, Hermitage Museum, Saint Petersburg, Russia. Wikimedia Commons. Paul Delaroche’s moving painting of The Young Martyr (1853) shows a young Christian woman whose hands were bound before she was thrown into the River Tiber in Rome, during the reign of the emperor Diocletian (284-305 CE). The writer and critic Théophile Gautier considered her a “Christian Ophelia”, and a paragon of divine beauty. As with the drowned man, Utonulá changed in the latter half of the nineteenth century. Increasing urbanisation and the many problems which it brought led to a steady succession of women jumping from bridges over the rivers which ran through the major cities of Europe. Painters couldn’t ignore the grim toll of the time. Vasily Grigorevich Perov (1834–1882), The Drowned (1867), oil on canvas, 68 x 106 cm, The State Tretyakov Gallery Государственная Третьяковская галерея, Moscow, Russia. Wikimedia Commons. 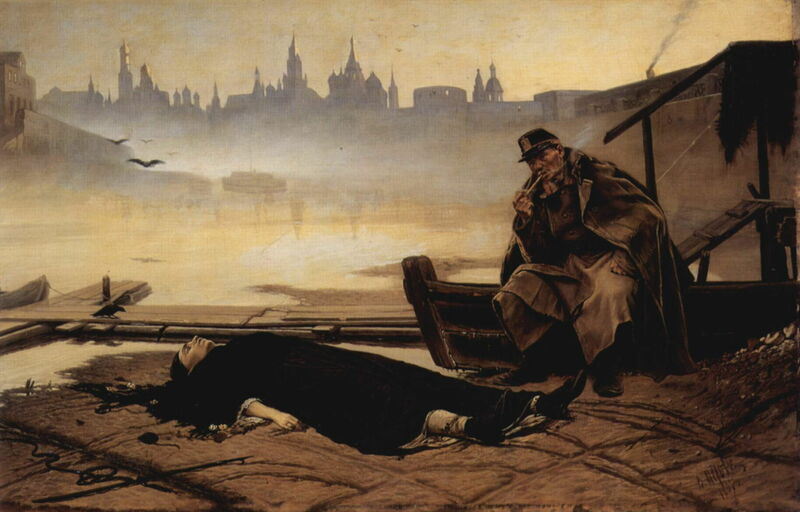 In Vasily Grigorevich Perov’s The Drowned (1867), a policeman sits beside Utonulá, laid out, flat on her back on the mud at the edge of the river, at dawn. I think the skyline is that of Saint Petersburg, making the river the Neva. Dressed in black, the woman is now but a void. George Frederic Watts (1817-1904), Found Drowned (1867), further details not known. Wikimedia Commons. 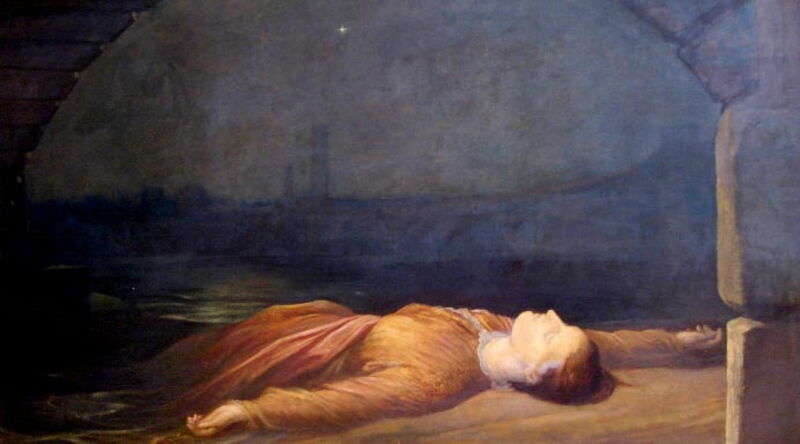 In Found Drowned (1867), George Frederic Watts shows a similar tragedy on the mud at the edge of the River Thames in London. His Utonulá has her arms stretched out as if in crucifixion, a martyr to a lost cause. Elizabeth Jane Gardner (1837–1922), The Imprudent Girl (1884), oil on canvas, 104.1 x 138.4 cm, location not known. Wikimedia Commons. 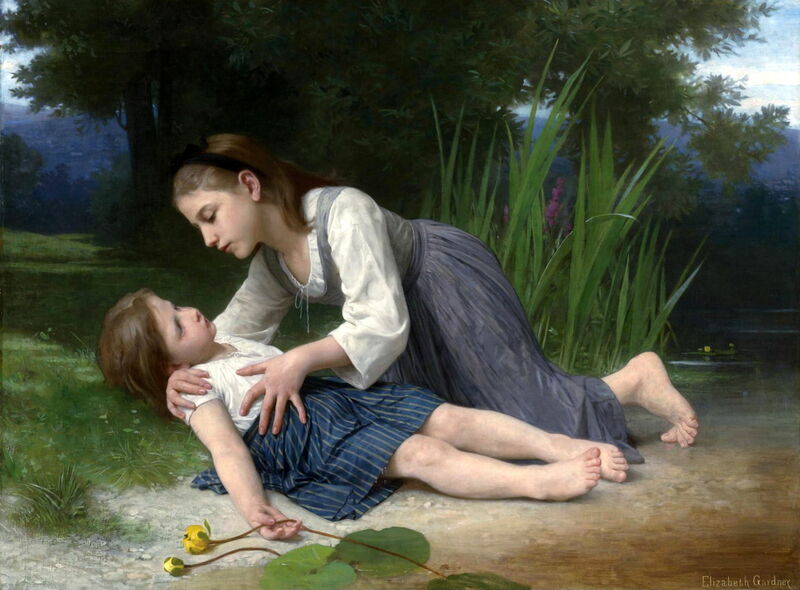 Young girls may be less prone to accidental drowning than boys, but Elizabeth Jane Gardner’s The Imprudent Girl (1884) shows that they are not immune, and leaves open the hope that this young girl survived after all. Gardner’s meticulous realism makes her image something of a cautionary tale. Winslow Homer (1836–1910), Undertow (1886), oil on canvas, 75.7 x 121 cm, Sterling and Francine Clark Art Institute, Williamstown, MA. Wikimedia Commons. 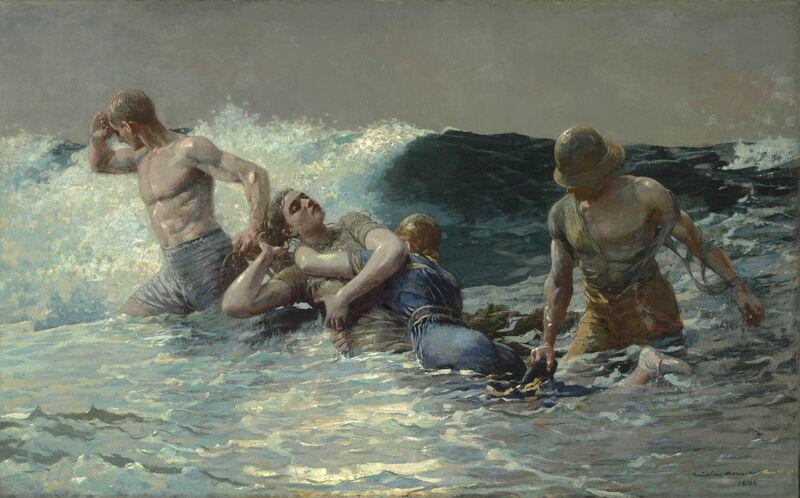 One of the most prolific and best maritime figurative painters of all time, Winslow Homer painted several scenes of rescue, including The Life Line (1884), but in Undertow (1886), shown above, the lifesavers’ bravery in pulling this woman from the sea may have been too late. But of all the paintings of the drowned, it is the Czech Jakub Schikaneder’s pastel of Utonulá (Drowned Woman) from 1893 which I find most impressive, and most moving. A young woman in a white gown rests, dead, on the sand of a beach. Her legs merge in the mist into the sand, making her appear almost ethereal. The sea is calm, the sun rising. There is no wreckage, no explanation for her drowning, just a calm and emptiness. Paul Albert Steck (1866-1924), Ophelia (c 1894), media and dimensions not known, Petit Palais, Paris. Wikimedia Commons. 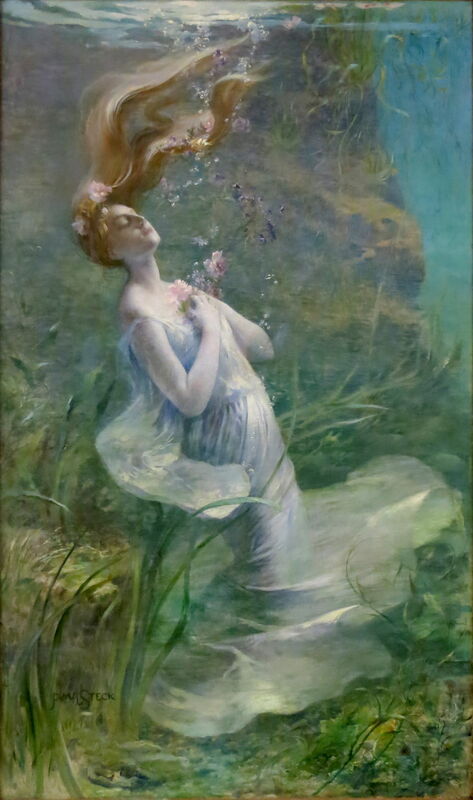 There are many other paintings of Ophelia, from which I have chosen Paul Albert Steck’s from about 1894 for its unusual sub-aquatic setting. In common with the image of Utonulá, there is a profound calm, a grace in the streamlines of the weeds, her dress and hair, and a dreadful finality in the last bubbles of air rising to the surface. 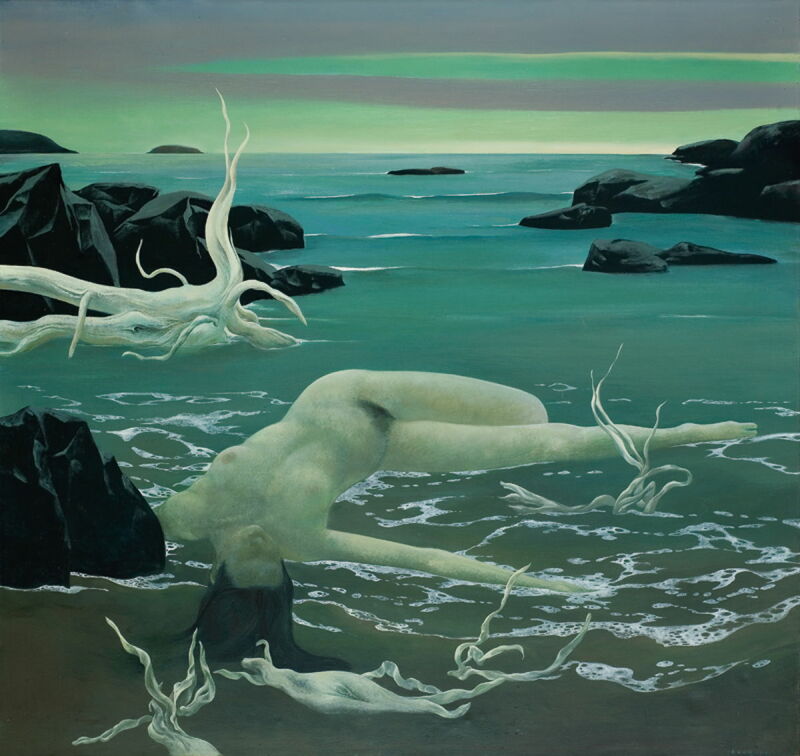 Jiri Kovarik (1932-1994), Utonulá (Drowned Woman) (1973), oil on canvas, 100 x 105 cm, location not known. Wikimedia Commons. My last painting – another image of Utonulá – is by a modern Czech artist, Jiri Kovarik (1932-1994), and was made in 1973. I don’t know whether Kovarik was revisiting Schikaneder’s pastel above, but he seems to have arrived at a similar place. Utonulá, the drowned woman. Profound calm, serenity, death as release. Posted in General, Life, Painting and tagged coast, Delaroche, Gardner, Homer, Kovarik, Millais, painting, Perov, Schikaneder, Steck, Utonulá, Watts. Bookmark the permalink.